Under the title European Echos four concerts were realized in the Erholungshaus Leverkusen. The sampler documents this series and gives an overview of the richness of a new creative genre. The works presented here show a wide range of possible variations with varying degrees of precision. Free improvisation mixes with various concepts, from abstract notes to programmatically conceived courses of action to the large-scale simultaneity of composed and improvised materials. 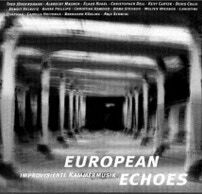 European Echos originally describes the echo of American jazz through European voices in the 70s. Today the term "improvised music" has established itself in Europe, playing forms come from all over the world, and meet an increasing opening of European musicians who reflect both foreign and traditional ideas, in search of a new global musical language. European Echos thus becomes a symbol for the renewal and vitalisation of our contemporary music through "world musical" influences. The result is European reflections full of associative power, collected on imaginary journeys, evoked by compositional incentives. Pieces 1-3 "Albrecht Maurer Trio Works"
Albrecht Maurer Trio Works presents excerpts from the suite "Von der Leichtigkeit des uner-träglichen Seins". The focus is on film originals, the lightness as well as moments of unbearable being. A "programme music for improvising musicians", consisting of 6 parts, 3 of which are presented here. composed figure according to the idea of the "Lola" *, with different soloists (here only the violin), who take the helm in their own personal way, creating cadenzas, replayings and lengths. In the character of the unbearable lightness of a prologue. Programmatic score, freely based on the dramaturgy of the film "Lola rennt" by Tom Tykwer. According to the film, a concrete musical form is run through three times. Small planned changes of direction lead to new improvised courses of action. The only requirement was the sentence "to play is a fantasy in the character of Jacque Tati&apos;s "Schützenfest". The result is a piece of music of compositional density that was nevertheless discovered collectively, falling from the sky and landing in three heads simultaneously. For Maurer, Lola is a form in which notated parts that are atmospherically connected with each other are passed through several times. With each repetition, insights and experiences are gathered that lead to musical change. The quartet creates an abstract chamber music between the context of notes and free spaces, which are loosely connected and whose dramaturgical course of action is determined by the aesthetic power of the improvisers. Hommage a Bela Bartok is an attempt to revive folkloric colours and moods through improvisation. From a minimalistically floating introduction, a powerful collective develops that leads into a theme whose clarity and folkloristic mood is reminiscent of Bartok. The key to this piece is a small collection of loops of different lengths. These loops are played simultaneously, creating new simultaneities in the course of time. The intersecting relationships inspire one theme (the desire for the opposite) as well as two duo encounters. The quintet - project goes on a search for the origins of organic musical power. In moments of intensive perception of the present, this power can arise. The musician&apos;s attention is not directed towards a specific project, it is open in all directions. The compositions presented here search for imaginary key stimuli to awaken the state of "unfiltered" perception. The state of highest contemporary intensity makes possible that chamber-musical density in the state of suspension between the various musical worlds. La Reunion is an island in the Indian Ocean with a gigantic volcanic landscape. For Maurer it is a symbol for the presence of the power of our planet. A fertile tropical paradise on bubbling lava. The music is characterized by lovely images in which the power of "Mother Earth" is present. The C&A department store is a symbol of the intense presence of our playful potential. Just as the Mozart ball is at home next to the sock rummage table, our musical roots here are equally present in the present. The sampler ends with a composition commissioned by Theo Jörgensmann. The work "Urwelle" by Christopher Dell extends over a wide, open arch. With his work, Dell presents an optional time cell structure that makes it possible to integrate improvisers and interpreters interactively, rather than additively, into an overall musical structure. As a consequence, an osmotic combination of sound visions and rhythmic spatial perspectives emerges. Like a rhizome, the work succeeds not only in superimposing the layers, but also in allowing them to take root in each other. Dell is concerned here with a metaphorical procedure, a moving at the edges of the actual in order to penetrate to the essential in between. The "primeval wave" does not seek, it finds.